The Gold Coast has long been known as a popular destination for family travel, from the stretch of sandy beaches and natural scenery, to the endless attractions aimed at families. One day on the Gold Coast is rarely enough. The Gold Coast is located at the southern point of the Queensland coast in Australia. This well known destination is high on the must see list for most people travelling to Australia (up there with Sydney and Melbourne) and the perfect all year round beach getaway. Not only are there endless beaches, parks and open spaces, there is also great shopping, fine dining and the Gold Coast theme parks – Movieworld, Seaworld and Dreamworld. But where is the best Gold Coast accommodation for families? We’ve put together our top 5 list to help you plan your next Gold Coast holiday. 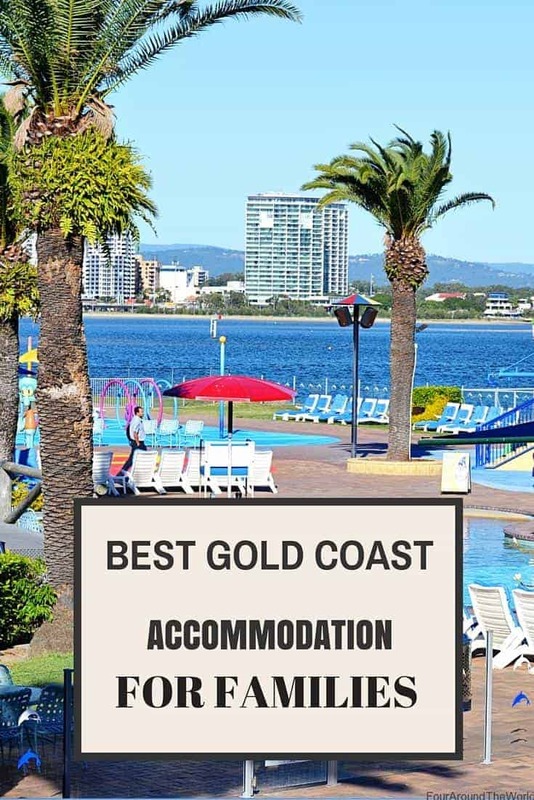 1.5.1 Do you have any recommendations for the best Gold Coast accommodation for families? Keeping with the best Gold Coast accommodation for families water park theme, Paradise Resort has 2 mini water parks on site – one for the juniors and one for the bigger kids. There is also playgrounds, laser tag, an ice skating rink, kids club and pretty much everything kids will want for a holiday, without even having to leave the resort. There is plenty on offer for mums and dads too, with a spa, heated swimming pool and outdoor bar area. The rooms accommodate up to 8 people (with connecting rooms) or 7 in a superior family room, perfect for larger families. Rooms are also designed with kids in mind, with bright colours and fun features, like gaming consoles and kids tv channels, perfect for travelling with kids. HIGHLIGHT – This resort is designed entirely with kids in mind so the highlights are many – especially the fact that there is entertainment all year round for kids from swimming and water play to indoor fun. The Big 4 Holiday Parks are a popular choice for family travel around Australia, and this one happens to be one of the best Gold Coast accommodation for families. With accommodation styles to suit all family sizes, preferences and budgets, the Big 4 Gold Coast Holiday Park is an affordable option. With a water slide into the large pool, and comfy pool side lounges for parents to supervise and relax. Set on 16 acres, the park also has walking tracks, BMX tracks, a jumping pillow, 3 and 4 wheel peddler bikes, tennis courts and plenty of other outdoor activities. HIGHLIGHT – During school holidays, a special kids program runs for extra fun for family holidays. Seaworld Resort and Water Park is the first place that comes to mind for best Gold Coast accommodation for families. Not only is it right next door to the popular Seaworld theme park, but it has recently been refurbished to include an upgraded water park of its own. Seaworld Resort is aimed at catering to families with kids of all ages. There are family rooms accommodating 4 or more, balconies with views, large bathrooms and spacious rooms. HIGHLIGHT – Seaworld Resort has a nightly light show in the water park/pool area with synchronised water sprays and music. This is pretty awesome to watch and the kids love it. Located within the popular Thunderbird Park on Mt Tamborine, Cedar Creek Lodges are a little outside the central Gold Coast area, however there is so much to do you won’t miss the hustle and bustle of the city at all. Thunderbird Park is known for the wide range of outdoor activities, from fossicking for gemstones, to having a blast at Adventure Park with rope ladders and bridges, as well as much more to entertain kids and adults alike. There are also horseriding facilities, bushwalking tracks, laser skirmish and the opportunity to get up close with nature. Accommodation ranges from budget camping sites to luxury lodges, aimed to suit all budgets and travel preferences. HIGHLIGHT – Getting into the great outdoors and enjoying the rainforest setting, while getting the chance to learn at the same time. You might even get lucky and find yourself a thunderegg. With a focus on providing great Gold Coast accommodation for families, kids under 3 stay free at Treasure Island Holiday Park and there is a huge range of room types to suit different budgets and family sizes. To keep the kids happy, there is a pool, a jumping pillow, mini golf and tennis. 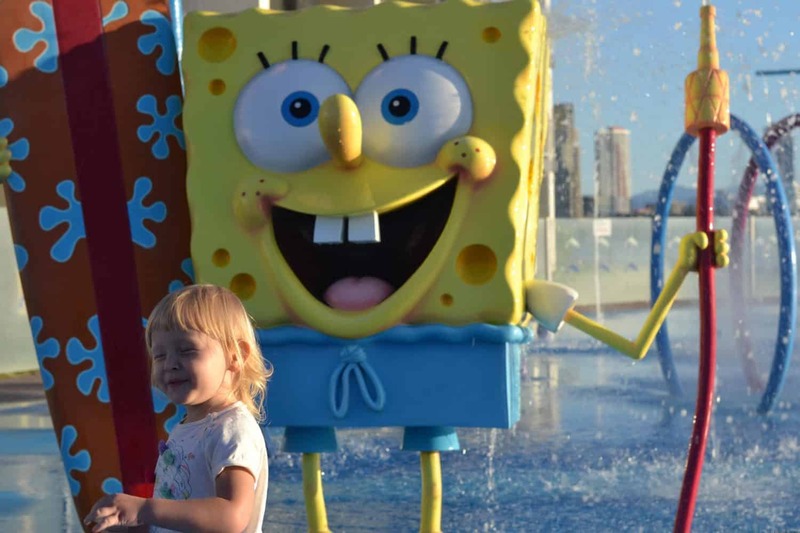 The park is close to major Gold Coast theme parks as well, or enjoy the on site playground if you would rather stay and enjoy the resort facilities. HIGHLIGHT – Plenty to keep the kids occupied at the park without having to venture far, but close to major attractions as well for added convenience. The Gold Coast has plenty of other great places for families to stay and visit, so you will always need at least a few days to enjoy this popular beachfront city. But don’t forget to check out all the great things on offer in nearby Brisbane, which is about an hour from the Gold Coast. Do you have any recommendations for the best Gold Coast accommodation for families? All of these accommodations sound wonderful! I love that they provide fun activities for the kiddos. Thanks for sharing! The Gold Coast is a wonderful place to holiday with kids. So well catered for with activities and facilities.